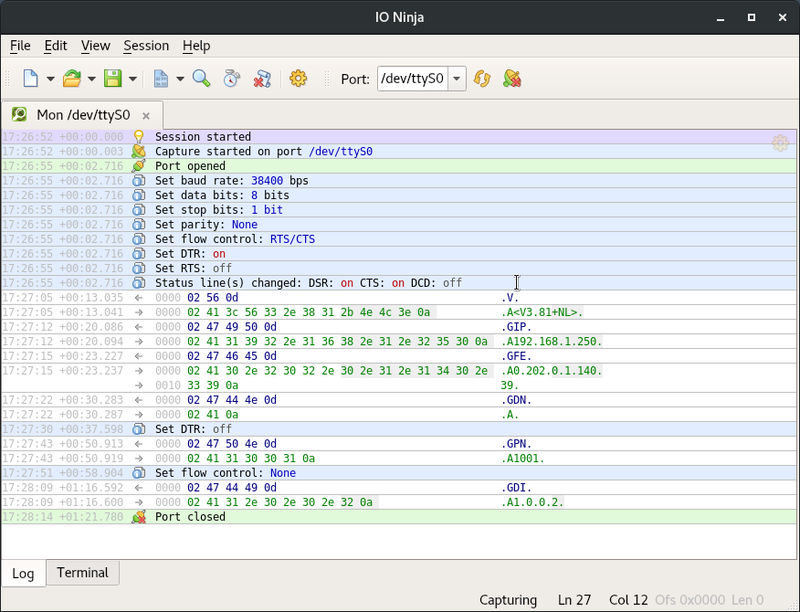 IO Ninja is a professional, scriptable, multi-purpose terminal emulator, network sniffer and IO monitor. It's aimed at network security experts, system administrators, and all kinds of software/hardware/embedded developers. 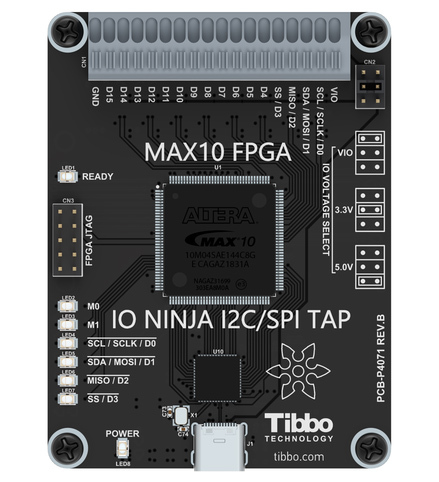 We are proud to introduce the new hardware I2C/SPI Tap for IO Ninja. This is an affordable sniffer for I2C and SPI communications. A native support for this sniffer device is provided via the I2C/SPI Tap plugin. IO Ninja 3.10.5 is out! 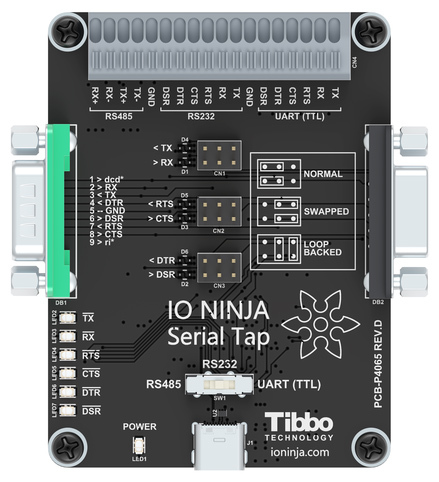 We are proud to introduce the new hardware Serial Tap for IO Ninja. This is a simple yet functional and convenient sniffer for asynchronous serial links (RS-232, RS-422, RS-485, TTL-level UART). A native support for this sniffer device is provided via the Serial Tap plugin. Performs serial communication using one of the installed COM/VCOM/CDC devices on your machine. Monitors data transmitted over any of the installed COM/VCOM/CDC device on your machine. Monitors data transmitted over any of the installed COM/VCOM/CDC device on a remote machine — using an SSH connection to this remote machine. Monitors data flowing through a RS-232/RS-422/RS-485/TTL serial link using our affordable hardware sniffer — Serial Tap. Monitors data flowing through an I2C or SPI link using our new hardware sniffer — I2C/SPI Tap. Monitors data flowing through popular tap-cables EZ-Tap Pro and Versa-Tap from Stratus Engineering Inc. Monitors data flowing through a generic dual COM tap-cable — such as EZ-Tap RS-232. Analyzes a serial communication log and and annotates the raw data flow with decoded Modbus RTU or Modbus ASCII messages. Establishes outbound connection over a TCP client-side socket. Listens for and accepts inbound connection to a TCP server-side socket. A man-in-the-middle for a TCP connection. Passes-through data between a TCP client and a TCP server while writing everything to the log. Reconstructs TCP communications from packets captured via Pcap and produced a clean data flow view. Performs one-to-one or one-to-many UDP communication over a UDP socket without the connection notation. Reconstructs UDP communications from packets captured via Pcap and produced a clean data flow view. Establishes outbound SSH channel over a TCP client-side socket. A data-centric front-end for Pcap — payloads visible instantly in the main log! 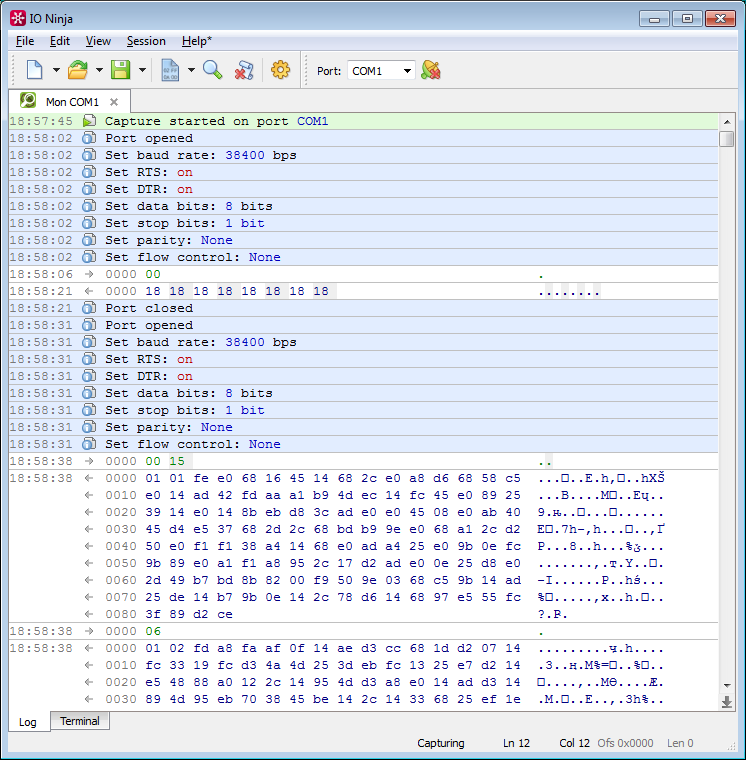 Analyzes a TCP connection log and annotates the raw data flow with decoded Modbus TCP messages. Performs reads and/or writes to a generic file stream — on-disk file, named pipe, non-standard device, etc. Listens for and accepts inbound connection to a server-side Windows named pipe. Monitors data transmitted over named pipes on your Windows machine — both local and remote (UNC). Receives inbound messages to a server-side Windows mailslot. Monitors data transmitted over mailslots on your Windows machine — both local and remote (UNC). Performs low-level direct USB control transfer over the USB endpoint #0 on a device. Performs low-level direct USB data transfers over bulk, interrupt, or isochronous endpoints on a device. Implements XModem protocol for file transmit/receive over ANY transport — serial, TCP, UDP, named pipe, etc. Efficiently colorizes RX/TX data according to the preset regular expression patterns. Adjusts outbound packets — appends prefix and/or suffix, re-transmits with the specified interval, inserts inter-character delays. Allows to filter out (exclude) TX or RX streams out of the log — extremely helpful when local echo clutters the view! Immediately transmits any inbound packet back — a simple, yet effective testing tool. Needless to say, it works with ANY transport! 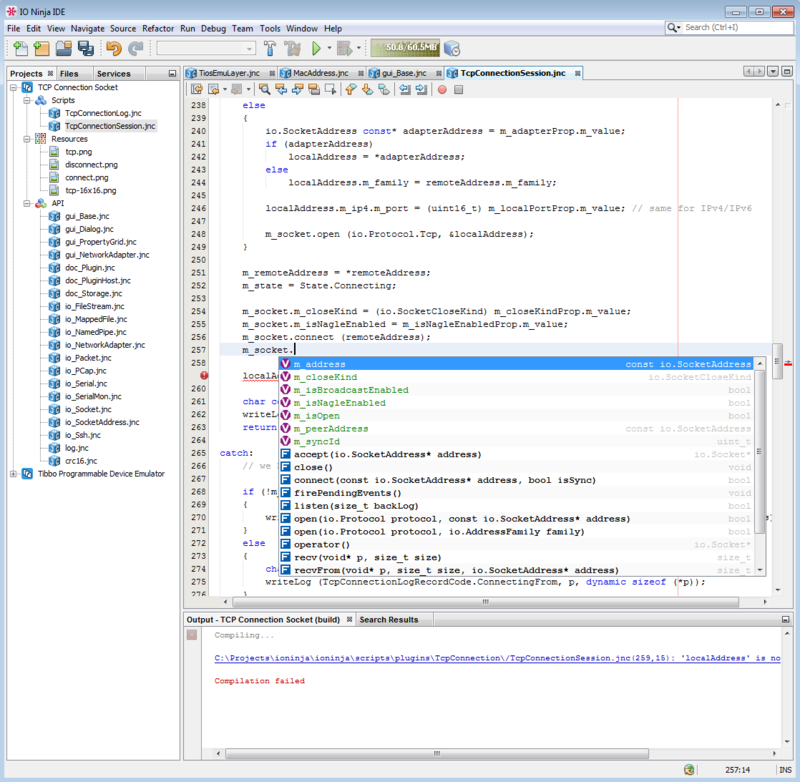 IO Ninja is powered by our innovative programming language Jancy tailor-made for IO and UI programming. Need a non-standard network protocol analyzer, a device emulator or an IO testing utility? IO Ninja can be programmed to do the job. IO Ninja comes with a convenient IDE and that means it's not only possible to customize it — it's fun (if you're a nerd, that is). 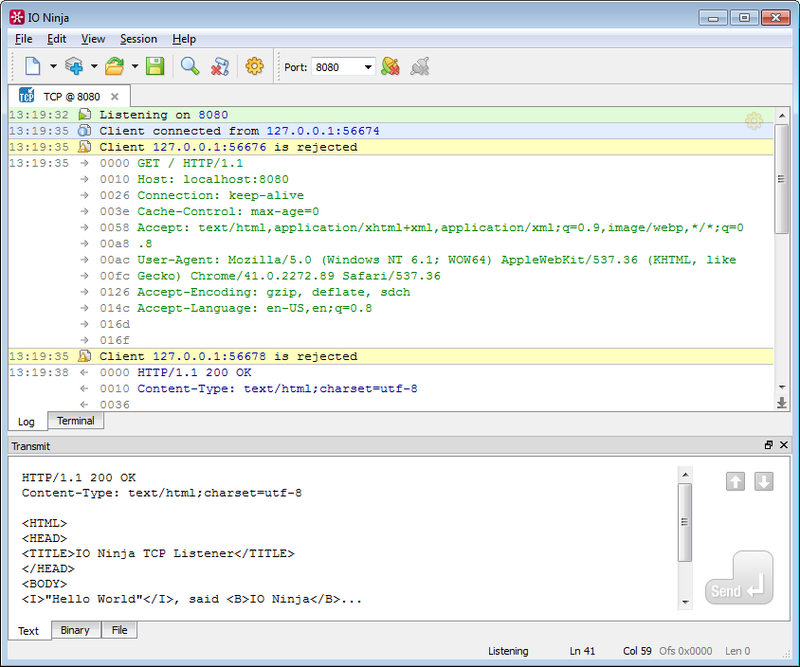 IO Ninja's advanced logging engine shows massive logs in a clean, easy-to-read way. It'll gracefully display informational text messages side-by-side with binary data blocks in either hex view or plain text representations. 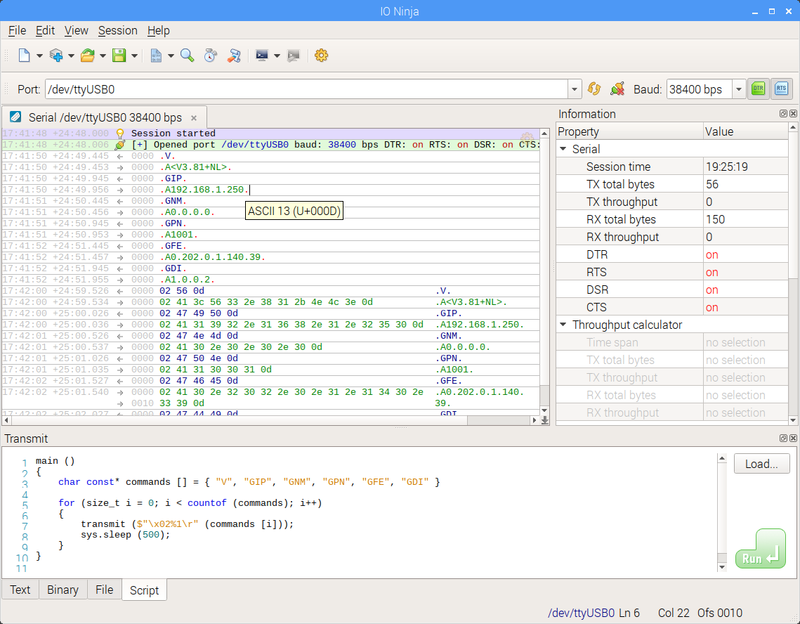 IO Ninja has excellent support for binary data transmission. 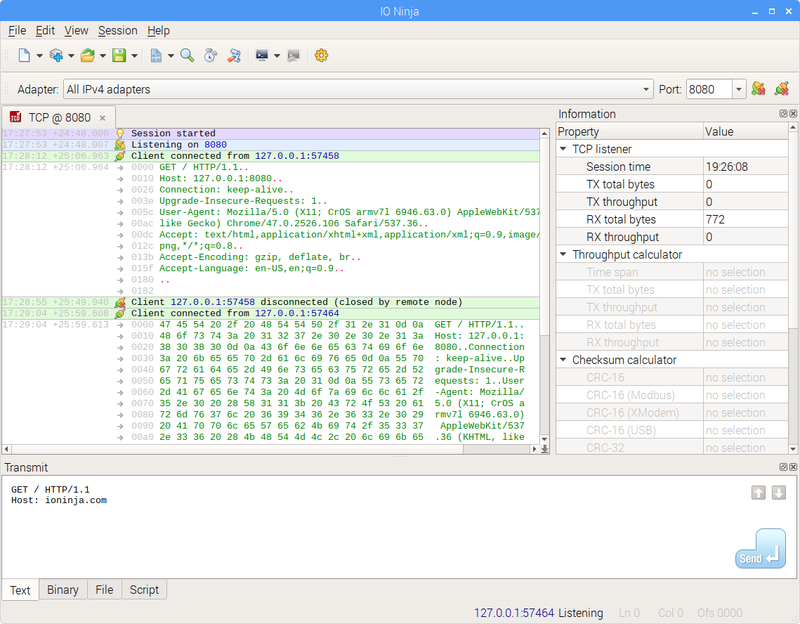 Need a low-level IO terminal tool to send binary data over TCP? Or send hex to serial port? Ninja would be the best tool for binary packets transmission. 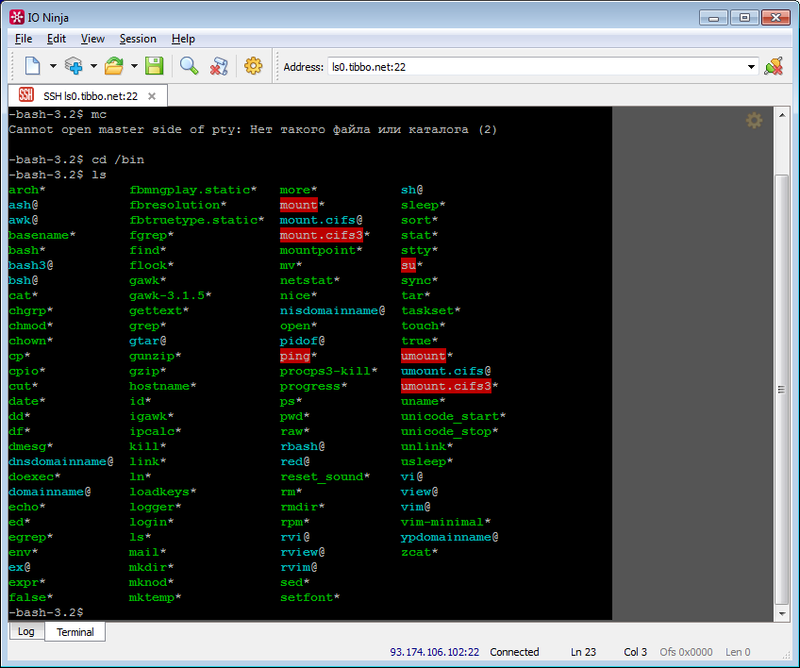 IO Ninja supports ANSI & X-Term terminal emulation; switch between log view and terminal console any time you want. IO Ninja provides a powerful and elegant way of redirecting data from any transport to any other transport with Session Linking. Think Unix pipes, but better. 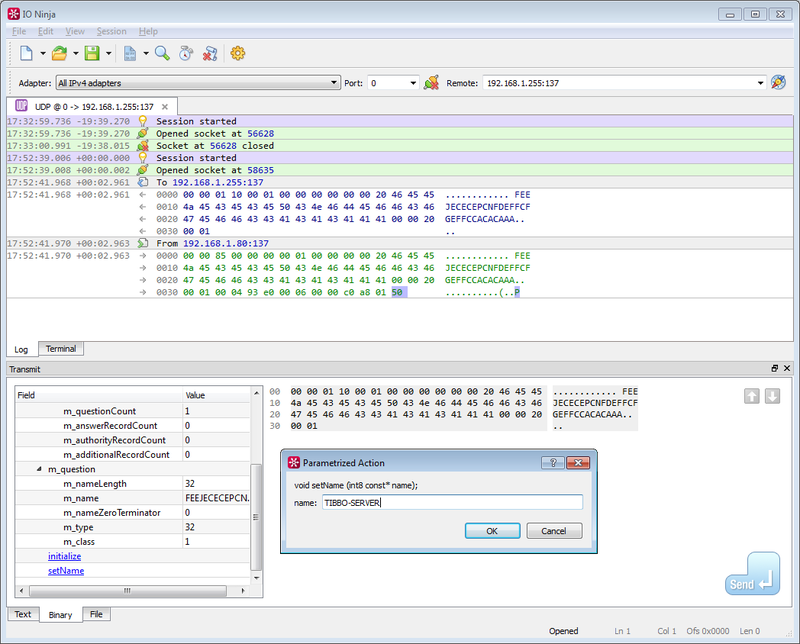 Write protocol analyzers or emulators, testing applications, and other utilities to extend existing sessions. IPv6 is slowly but steadily taking over the Internet. IO Ninja is here to help testing IPv6-connectivity of your products. No more question marks! IO Ninja can show and send characters in any Unicode encoding. Feel free to inspect, fix and update the official IO Ninja plugins. Use this public issue tracker to report bugs, suggest new features and discuss the further development of IO Ninja.